Program information will be updated soon. Thanks for your patience. If you would like information about enrolling your child, see admission. We welcome you to visit our school or contact us for more information. We begin our school year in September, after the Labor Day holiday. The remainder of the year generally parallels that of the public school calendars in the area. Three and four year old children, attend five days per week, either a half day session from 9:00 - 12:00, or a full day session from 9:00 - 3:00. Kindergarten and elementary classes are from 9:00 - 3:00. Toddlers attend either two, three or five days per week, from 9:00 - 12:00 or five days per week full day, depending on the needs of our parents. We offer extended daycare hours from 8:00 to 9:00 am and from 3:00 to 5:30 pm for all age students, except Toddler. We also offer summer programs for all children, from toddler thru sixth grade. Our toddler program serves a small group of children, ages 18-36 months. * The toddler teacher serves as a link between home and school, providing gentle and helping guidance while encouraging independence and freedom. The environment is geared to the needs of the toddler and enhances each child’s cognitive, physical, social and emotional growth. Each morning, the children are engaged in manipulative materials, group activities with stories, music and movement and outdoor large motor play and gardening. After lunch, the children in our full-day program enjoy stories, naps with quiet music, and continued activities. Toilet training is part of our program. *child must be 18 months on or before July 1st. Our spacious primary classroom is an attractive, busy and happy place for our 3 to 5 year olds. Guided by their own natural curiosity and interests, children choose between a variety of educational materials. Our four primary Montessori teachers facilitate this learning process by introducing new materials and activities when appropriate. Many “practical life” materials teach the children self-reliance, while other exercises introduce the skills necessary to care for their surroundings. All assist in developing fine motor control and in lengthening their growing attention span. Montessori “sensorial” materials help the children refine their developing senses. By manipulating materials of graduating sizes, colors, weights and textures, children learn ways to organize the information that their senses collect. Mathematics are presented to the child through manipulative materials-by using these, they can easily and joyfully assimilate many facts and skills. The individual presentation of language materials allows the teacher to take advantage of each child’s greatest periods of interest. Phonics are taught using the sandpaper letters and movable alphabet; the child naturally builds reading and writing skills upon this foundation. Physical geography, science and nature, art and handwork, music, foreign language and computer skills are also integral parts of the curriculum. Our kindergartners attend a full day program, allowing time for special geography, science and art projects in the afternoon. 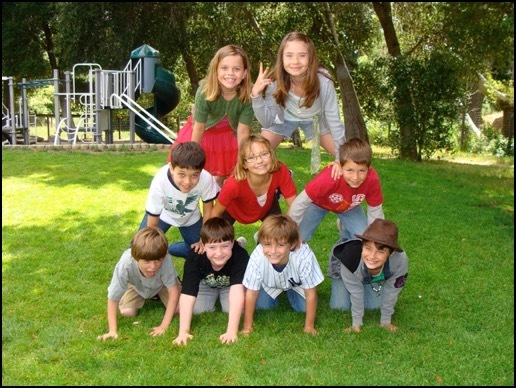 The elementary program balances the natural enthusiasm of each child with careful attention to academic development. Within a framework of high academic standards, our programs emphasize creativity, self-discipline and independent decision making. The morning hours are primarily devoted to the language arts, math and geometry studies. The children work individually and in small groups with materials designed for their particular developmental level. A low student teacher ratio along with individualized curriculum establishes more intimate contact between the child, teacher and the work. Science and cultural studies take place throughout the day. Life sciences, physical science, cultural studies, history, and geography are studied in depth. These experiential studies call on a variety of skills to explore, integrate, and express the information such as in daily journals, timelines, art projects, research reports, and relevant field trips. Dynamic and colorful manipulatives which materialize abstract principles are used throughout the entire curriculum which also includes art, art appreciation, music, computer technology, Spanish and physical education.